In modeling mode can you bring in a repeat region for a BOM to be populated? We are doing no drawings so I need to do this in the assembly models. Re: Creo 3.0 repeat region? It doesn't seem familiar - where do you expect the repeat region to appear if it's not part of a drawing? repeat region can be created in a drawing, only. In Assembly mode, you can save Bill of materials into text file and put the contents of this file into annotation element.Unfortunatelly this annotation element is not updated dynamically, when assembly changes. This does seem like a gap in the whole "MBD" push. If this information isn't on a drawing, and it can't be put in the model, how is it supposed to be conveyed? In the MBD World, it needs to be conveyed in a separate parts list that can be generated from Windchill. Take a step back and think about your BOM balloons on a drawing, if you have 2 or more of the same part, the balloons really don't tell you much. 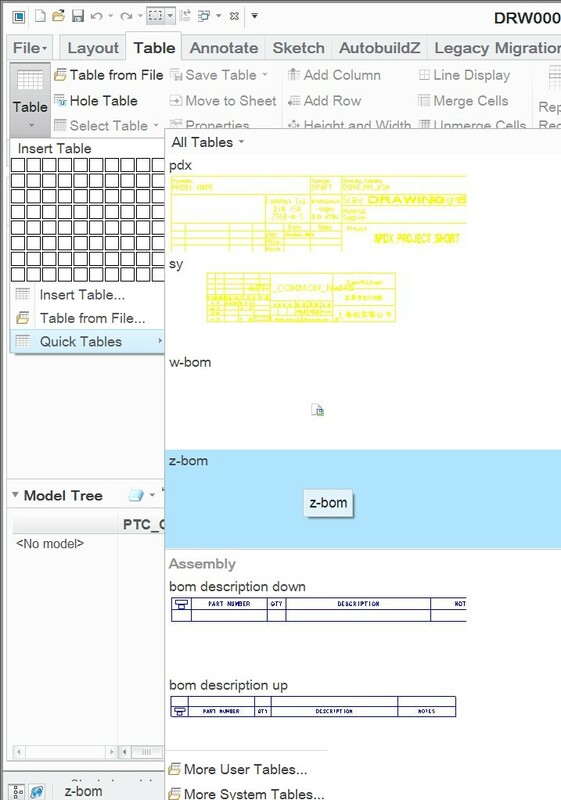 Why do you need to see the parts pointed out on a view when the BOM is used by a different department to order the parts, they don't count the parts in the assembly view to make sure it matches the BOM quantity. On drawing BOM is just something that has been done for decades and now it is time to change. There are lots of major companies that have gone drawing less. The MBOM is what you need to convey in the Assembly Instructions (AI). I thought the whole point of MBD was to have everything you need contained in the model. Are you saying you can't do MBD without a PDM system and extra MBOM documents? How does this approach help vendors who only get the models and don't have access to your PDM system? If I have to generate extra documents to ride along with the model, how is this any better than just creating a drawing? Everything I've seen on MBD is an attempt to get the information currently on the drawing moved into the model. This is simply not possible today with the current 3D annotation capabilities. One typically distributes the balloons such that it is obvious which items are which. Without the balloons one has a list that shows maybe 150 screws and there is no idea where they go without having a computer to search for them. Worse, there's no MBD place to check-off which ones have been installed during the assembly process, a typical oversight in MBD systems architecture and there is no way to associate secondary information, such as torque notes and locking compound use. So far, there is no MBD World, even though there are a few tiny MBD islands. When Catia, Autodesk, Siemens, PTC, et al produce an interoperable, origin blind system for interchanging factory-floor process instructions, then it may be an MBD World. I think common use of cheap personal flying cars will appear first. Were you at PTC Live, if so did you see our presentation on MDB and 3D PDF's thru Anark? Q: One typically distributes the balloons such that it is obvious which items are which. Without the balloons one has a list that shows maybe 150 screws and there is no idea where they go without having a computer to search for them. A: The BOM is really for purchasing. We are transferring all new drawings to be separate parts list. The engineer that is creating the drawing already knows which part goes where. This is a mental shift. If you have Creo View then anyone can see assembly without the need for Creo Parametric. Adding BOM Balloons really just adds engineering time. A: The Check-off process should be in the Assembly Instructions (AI) which could be leveraged in a 3D PDF. A: Our 3D PDF's allow that with attached surface highlight. I do understand that not everyone has the same budget, but this is the path that we are marching down. Anark has also been chosen by the Army and NIST for 3D PDF's and MBD. Sales pitch for a proprietary lock-in solution. Does it depend on the use of 2D display screens?